In the wake of Roe v. Wade, conservative members of Congress behaved exactly as one might expect: by attacking the rights of marginalized communities. First passed in 1976, the Hyde Amendment (in the words of the late Supreme Court Justice Thurgood Marshall) was specifically “designed to deprive poor and minority women of the constitutional right to abortion.” Although Hyde is not permanent law, anti-abortion lawmakers have added language to annual Labor, Health and Human Services, Education, and Related Agencies appropriations legislation barring programs in these agencies (Medicaid, Medicare, and CHIP) from covering abortion. The federal Medicaid program provides health coverage to over 72 million low-income Americans and accounts for 17% of the country’s health care spending. Guess who makes up the majority of adult Medicaid beneficiaries? That’s right. Women. Furthermore, 58% of women of reproductive age enrolled in Medicaid or CHIP live in states that also ban Medicaid coverage for abortion, except in extraordinary circumstances. Medicaid coverage often means the difference between getting an abortion and being denied necessary health care. Studies show that when policymakers place severe restrictions on Medicaid coverage of abortion, one in four lower-income women seeking abortions are forced to carry unwanted pregnancies to term. Keep in mind that the cost of the procedure is not the only expense these women have to consider. Travel expenses (possibly across hundreds of miles within the same state or even across state lines), hotel fees (necessary in states with 24 or 48 hour waiting periods), and child care costs — combined with lost wages from taking multiple days off work — push abortion out of reach for many low-income women. Women with fewer resources should not have inferior access to care. The EACH Woman Act would end politicians’ interference in a woman’s exercise of her constitutional right to abortion and ensure access to safe and legal health care regardless of income level. Women of color already face multiple barriers to obtaining the reproductive health care they need. They often experience lack of access to primary care and trusted providers, long geographic distances to the nearest facility, limited access to transportation, constrained economic and social resources, and poor patient-provider communication stemming from lack of access to culturally-competent care. Additionally, de facto segregation and racism continue to contribute to inferior health outcomes for women of color. For example, despite the fact that we live in the wealthiest nation in the world, African American women are dying in childbirth at rates comparable to those of less affluent nations, and at three to four times the rate of white women. Women of color are also more likely than white women to be insured by Medicaid and have higher rates of abortion and unwanted pregnancy. The most recent census data reports that 28.5% of lower-income women of reproductive age are African American, 27.2% are Hispanic, and 27% are Native American while just 15.8% are white. In a medical system that has historically withheld information from communities of color and ignored their pain, it should come as no surprise that women of color are disproportionately harmed by Hyde. Truly living our Jewish values means that we must not stand idly by while barriers to health care place any individual’s autonomy, health, economic security, or well-being at risk. This is especially true for women of color who face pervasive structural barriers to exercising their basic human rights. Make no mistake, public health programs save LGBTQ lives. LGBTQ individuals are more likely to be low-income and to rely on federal programs; case in point: roughly 1.2 million LGBTQ adults are enrolled in Medicaid as their primary source of health insurance. LGBTQ people have greater health needs, experience more physical health challenges, and are more likely than straight or cisgender people to rate their health as poor. Moreover, many people in the LGBTQ community — cisgender women, transgender men, intersex and gender-nonconforming people, among others — are able to reproduce and rely on a full range of reproductive health options, including abortion. Unfortunately, LGBTQ communities also face similar barriers to accessing health care including discrimination, lack of culturally competent care, and lack of coverage and providers. In a survey examining discrimination against LGBTQ people in health care, more than half of respondents reported that they have experienced at least one of the following types of discrimination in care: refusal of needed care; health care professionals refusing to touch them or using excessive precautions; health care professionals using harsh or abusive language; blame for their health care status; or health care professionals being physically rough or abusive. The fear of this discrimination leads LGBTQ individuals to delay care, to refrain from seeking care, or to hide their sexual orientation or gender identity. As Jews, we believe that every single person’s health is paramount and inalienable. Every human being deserves fair treatment and access to the resources they need (including insurance coverage of abortion) and to make their own decisions about their bodies and future without political interference. Abortion access is an economic justice issue. Controlling family timing and size is essential to women’s economic success, educational achievement, and equality and can help families break cycles of poverty and government dependency across generations. When a woman cannot afford an abortion, the consequences on her family can be far-reaching: a woman who is denied abortion care is more likely to fall into poverty than a woman who can obtain the care she needs. Coverage bans also effect the mental health and social stability of families. For instance, increased conflict and decreased satisfaction in relationships — as well as amplified odds that the relationship will fail — are linked to unplanned births. Unplanned pregnancies and births are also associated with depression, anxiety, and lower reported levels of happiness and fulfillment. Allowing parents to plan and space births leads to increased investment in their children and, in turn, benefits children’s mental and behavioral development. Let’s do some simple math. Access to abortion + the power to decide whether and when to have children = improved family health and economic stability. The Hyde Amendment not only restricts abortion coverage through Medicaid, but also extends to federal employees and their dependents, Peace Corps volunteers, Native Americans, pregnant individuals in federal prisons and detention centers, pregnant individuals who receive care from community health centers, survivors of human trafficking, and low-income women in the District of Columbia. And again, because the Hyde Amendment is not permanent law, Congress has the opportunity to lift these restrictions every year. Jewish tradition teaches us that we must pursue tzedek (justice) for all. We also believe in respect and dignity for all human beings (kavod ha bri’ot). Access to basic health care (which undoubtedly includes abortion) should never depend on your insurance, your address, your income, your race, your sexual orientation, your gender identity, or any other factors. Each woman deserves reproductive, sexual health, and maternal health services in addition to comprehensive, affordable, confidential, accessible, and equitable family planning. Passage of the EACH Woman Act represents an important step in making this absolute necessity a reality. Unapologetic feminist since ’93. 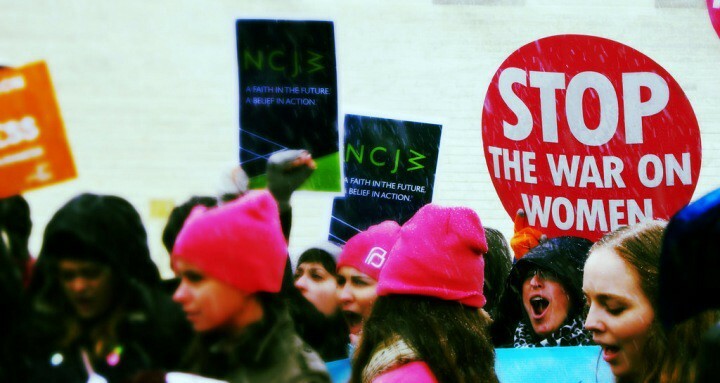 Advocate for reproductive health, rights, and justice at the National Council of Jewish Women.